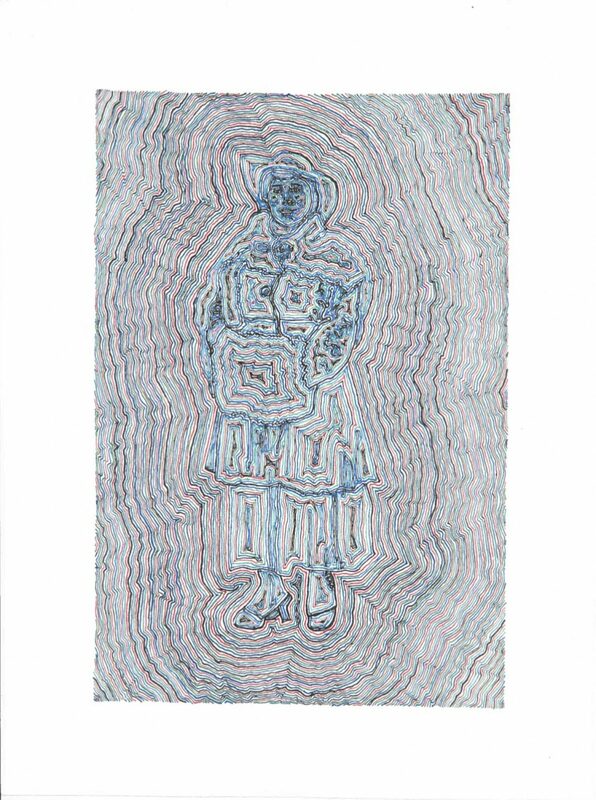 Recalling tree rings, a thumbprint, or ripples in a pool, these drawings use the language of topographic mapping to portray my relatives. The images are sourced from photographs that were collected by my aunt Barbara Siegel Lang. Over the years she has devoted herself to researching and chronicling the lives of our distant relatives. Many of these women I could never meet, most of them led lives shaped by Russian Cossack oppression and then Nazi occupation. Many lost their lives in the Holocaust. As my hand draws contours around these line drawings I see bits of my father, aunt, grandmother, and myself. Every little mark and imperfection of my hand creates waves through the image, like each moment of history affects the next. The actions we take today have irrevocable impacts that shape the future. We must remember that legacies of discrimination, hate, and exclusion are imbedded in our culture and it is our duty to look closely and reshape these patterns. Corrie Siegel is a Los Angeles based multimedia artist who has exhibited nationally and internationally. Mining individual and collective histories, she uses highly involved processes to occupy a position between objectivity and interpretation. Her projects have been profiled in the Los Angeles Times, Mousse Magazine, Droste Effect, and Flash Art International. She received her BFA from Bard College and is currently pursuing a MFA with a concentration in Curatorial and Critical Studies from University of California, Irvine. She is currently an Armory Fellow. She was also a Word grantee, Dream Lab fellow, Culture Lab fellow and Six Points Fellow. She is the director of Actual Size Los Angeles. Actual Size collaborates with established and emerging artists to allow for situations that activate the exhibition and engage the public. Art talks, featuring the artists and curator are free. Tickets must be purchased for performances. This entry was posted in News on January 15, 2018 by Corrie Siegel.